For the second "How I Paint" instalment I thought I'd continue the Chaos theme by talking about the Iron Warriors that I've added to my Word Bearer force. 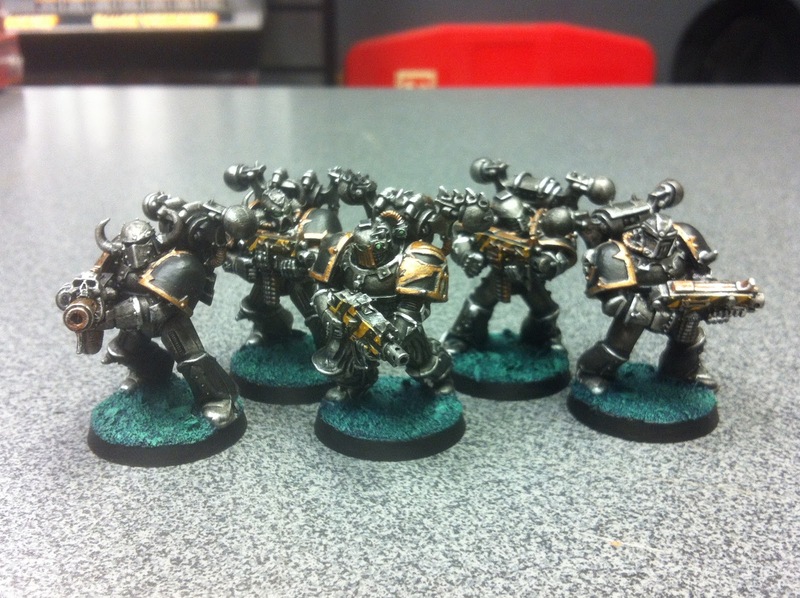 I know, Iron Warriors and Word Bearers, it's a little unusual, but I have my reasons. So why do I have Iron Warriors, the paranoid, bitter and distrustful traitors, fighting alongside my religious zealot Word Bearers? In a word, daemons. Word Bearers view themselves (or rather, the Adeptus Astartes) as the pinnacle of humanity. There are none in the human race more powerful than the Space Marines. Daemons, on the other side of things, are beings of pure spirituality; thus, to the Word Bearers, the fusion of the two is the most divine form humanity can take, the closest one can become to the true gods of the galaxy, short of daemonhood in full. The Iron Warriors, on the other hand, are much more secular. To them, daemons are tools, ammunition, fuel for their machinations and war engines. 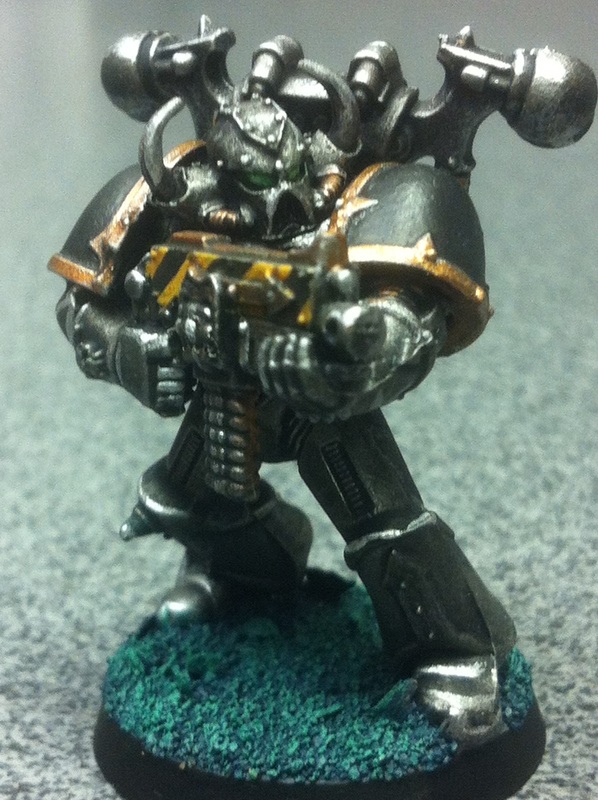 Enter the Warpsmith Kar'Thanal, the Warlord of my force. Kar'Thanal, like most Word Bearers, believes in the divine purity of daemonic possession, but after a tenure fighting alongside the Iron Warriors, began to push this drive further and further. Why stop with the possession of the mortal shell? Sure, many of his legions vehicles and weapons had daemons bound within, but to Kar'Thanal, this was not even close to enough. Devoted utterly to the Ruinous Powers and obsessed with his studies of Daemonology, Kar'Thanal will not stop until the entire material galaxy is fused inexplicably with the immaterium; man, machine and weapon, as one with the daemon. In short, I really like daemons in 40k. Daemon units, daemon weapons, daemon engines... and I wanted an excuse to have as many of these as I could. 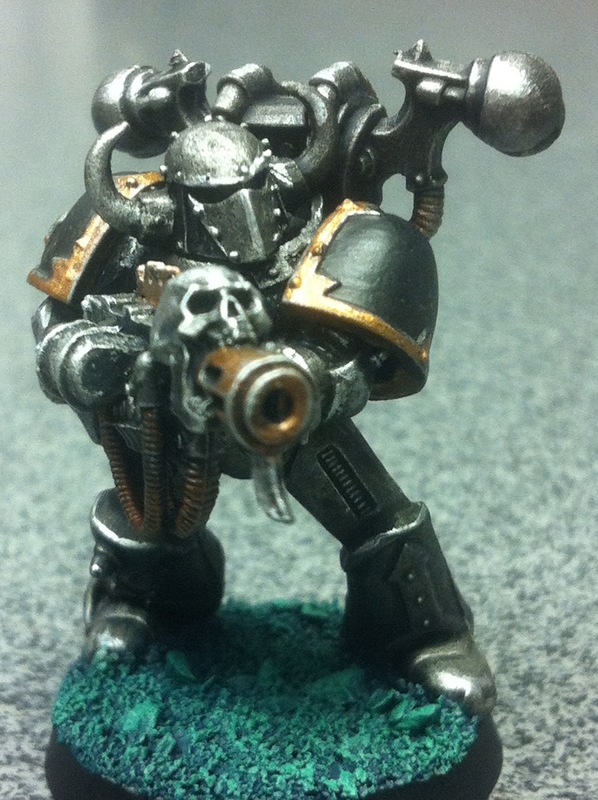 I imagine that Kar'Thanal, master of binding daemons to weapons and physical forms, has made a pact with an Iron Warrior warband for their services and expertise in daemon engines. In truth, however, this is all just an elaborate excuse to include some cool models in my army and to paint up some Iron Warriors - something I've always wanted to do but never had the drive to do a whole force. As usual, I worked from a Chaos Black Spray undercoat. However, unusually, I did the first two steps of both the Power Armour and the Brass Trimming before I continued with each section. In other words, I basecoated both the armour and trims, then washed the armour and trims, then did the Ironbreaker drybrush (across the whole model including trims) before continuing each part separately. *As yesterday, these steps are 'all over' drybrushes. **This step was done across the whole model, as detailed above. ***A neatening up stage, leaving a bit of the Ironbreaker drybrush showing on the edges of the trims. ****Small 'scratches' of Averland Sunset were added across the black stripes to simulate damage. As shown on page 95 of "How To Paint Citadel Miniatures" and shown on the DVD. The bases are detailed exactly as with the rest of my Word Bearers, shown in this blog post. I really like the paintwork but find the green on the base is a bit alien looking. Like a cup cake icing. Otherwise great though. Thanks for the comment, Robin! Glad you like the silver, I was trying out something new with it and glad it came out ok.
A late comment, but still I do want to ask. The paint scheme you have here is superb and works really well. At the moment I am working on the eyes. As I don't have the Citadel painting guide on hand, I would like to ask how you've done the eyes: did you paint the eye lens area with white and then wash it with green? I've never done eyes this way before, but it seems like a really nice detail. Nice guide . 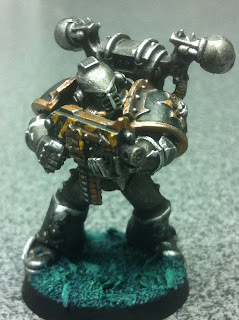 There seems to be very few guides to painting Iron Warriors on the net so its good to see somebody having a go. I`m going to paint some up shortly so I will let you know how I get on.